As an artist, Eddie Grey has been considered a fore runner in the entertainment circles and specifically for his contribution to jazz in East Africa. Coming from a musical family, he spent most of his childhood enjoying the influences of jazz, soul and pop artists at the time. The rest he defines as a gradual relationship with guitar driven music with stand out influences such as Ali Farka Toure, Tabu Ley, Django, Wes Montgomery, Joe pass, George Benson, Jonathan Butler, Bebo Norman, Earl Klugh, Tommy Emmanuel, Lionel Loueke and many others. 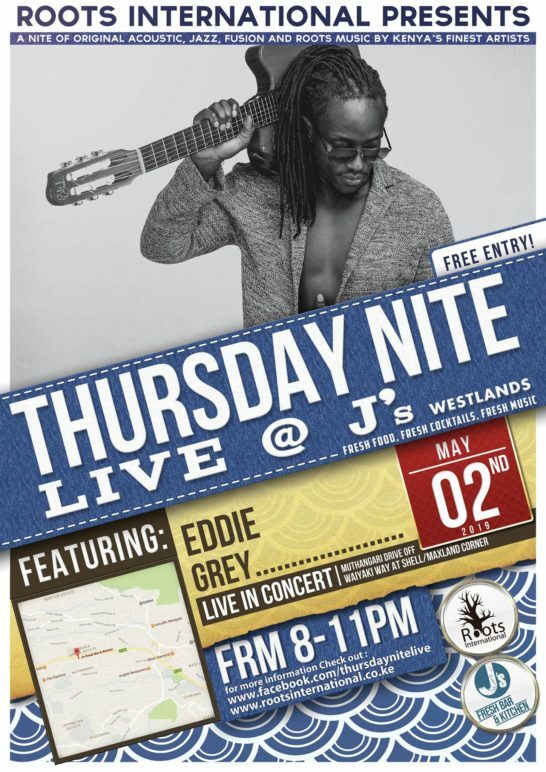 In January 2009 Eddie Grey released his debut album entitled NO TRAINS TO KIBERA. Since 2010 Eddie Grey assembled a host of musicians through his musical expeditions round East Africa. The sounds picked across different regions influenced greatly the sound of his next album Stories by the Lake released in 2010. In this album he features Regional Artists such as Mulatu Astatke (Ethiopia)Solange (Democratic Republic of Congo)Nali Rabeson (Madagascar)Winyo (Kenya)June Gachui (Kenya)Olith Ratego (Kenya)Kate Bingley (London). In 2019 after a 10 year recording process, Eddie Grey will release his 3rd Album, World to Come, a Psychedelic mix of Jazz, afro beat, rnb, hip hop and electronica that passes on strong messages on Tolerance, future of the environment, politics, love and self worth. His new album is inspired by the revolutionary works of Miles Davis and the emergence of the Compton hip hop superstars such as J.cole and Kendrick Lamar. It features major collaborations with U.K Grime artist NoLay, Kenyan Jazz Pianist Aaron Rimbui, The mAAD Orchestra and Ugandan saxophonist Michael Kitanda . The album also features collaborations with musicians from the Turkana community and singer/violinist Alexi Muriithi. Other featured acts include The Batwa from Rwanda, Ugandan Saxophonist Brian Mugenyi, , Indian Flute player Kirit Pattni, Scott the Violinist and other special acts.